Establishing a winning identity isn't easy. Sporting Kansas City has the silverware to show for its work and wants more, while the Red Bulls are out to clear a trophy hurdle in the U.S. Open Cup final. Jesse Marsch’s words lacked the typical precision. But the detail-oriented New York Red Bulls coach should be forgiven. It was just a quick tangent during a Monday conference call, and everyone listening understood exactly what he was saying. The Supporters' Shield obviously is a trophy. It’s big, heavy and shiny. Players lift it over their heads, carry it around and take pictures with it. There are two Shield banners hanging at Red Bull Arena, in fact. It’s definitely a trophy. The Shield isn’t a title, however. It’s awarded to the team that concludes the MLS regular season with the best record. It’s certainly an honor. And it warrants respect and is worth commemorating. But the Shield isn’t a championship of anything. And what the Red Bulls have never done, going back to the MetroStars days, is win a championship. Everyone at the club knows it. Players new and old know it. And their die-hard fans now have been waiting for decades, while the opposition continues to rub it in. "Why does Red Bull come in cans? No cups." On Wednesday evening, Marsch and Co. have a long-awaited opportunity to end that record drought. NYRB, whose years of near misses and playoff agony are as much a part of the club’s identity as the kits and stadium, face Sporting Kansas City in the 104th U.S. Open Cup final. The game at SKC’s Children’s Mercy Park is for a bona fide championship—that of the U.S. Soccer Federation—and even though it’s not as publicized or as prestigious as MLS Cup, it’s a trophy and a title that will mean a great deal to the team that claims it. Sporting has a very different track record. It’s hard to miss the high blue wall at CMP where the club memorializes its many triumphs. 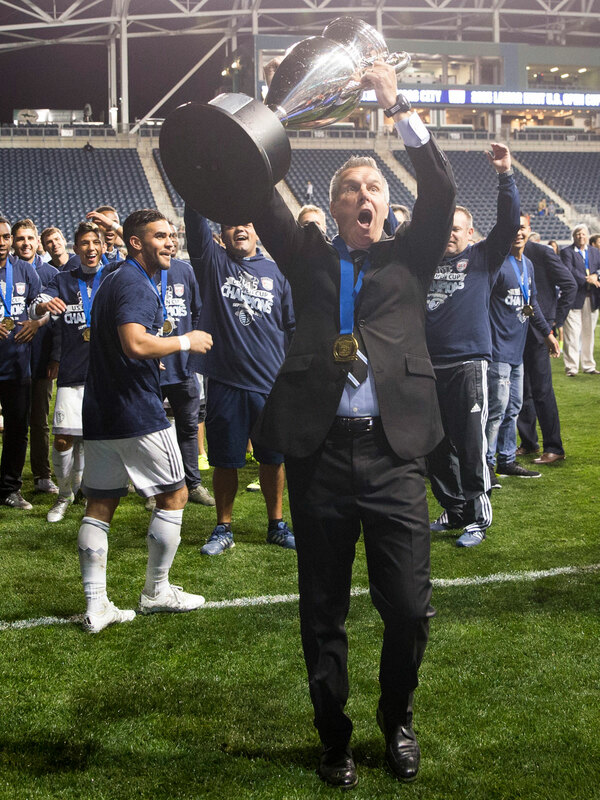 There have been two MLS Cups and three Open Cups (along with a Shield), three of which were won under Peter Vermes’s leadership. Like Marsch, the SKC manager is a hard-nosed, decorated former footballer working to build a winning program without spending multiple millions on a single player. There’s no formula for that kind of success, which is very difficult to sustain. Wednesday’s final is as much about that quest as it is the longer-term histories of each club. On the surface, sure, it’s the small-market winner hosting the big-market loser. Do those trends and traditions transcend a given group of men? Beneath that, however, it’s about the structures and cultures built by Marsch and Vermes. The latter won big. Now he’s trying to do it again with an evolved playing style and a roster that’s been through significant changes. Is small-market success repeatable? The former has presided over a three-year period during which the Red Bulls have broken with the past in search of a more fruitful future. Thierry Henry, Rafa Márquez, Juan Pablo Ángel, Bruce Arena, Carlos Alberto Parreira, Tab Ramos, Roberto Donadoni, Lothar Matthäus—we could keep going–none of those big names brought a title to North Jersey. Now the stars are men like Sacha Kljestan and Bradley Wright-Phillips, who’ve been overlooked or underappreciated elsewhere. And there’s as much (or more) focus on development as recruitment. Will this fundamental shift in identity finally pave the way to glory? That’s what Vermes and Marsch have focused on, even through recent disappointments. SKC won the Open Cup two years ago but suffered a pair of razor-thin MLS Cup knockout round defeats since. That’s old hat for the Red Bulls, whose playoff nightmares continue. They won the Shield in 2015 but fell to Columbus in the Eastern finals, then were stunned by fifth-place Montreal in the conference semis last fall. But neither manager got discouraged and both continued to build. SKC added some skill in Gerso Fernandes and Latif Blessing and became even better on the ball. NYRB got younger. Homegrown players like Aaron Long, Tyler Adams and Alex Muyl are major contributors who don’t carry past playoff baggage. Austrian winger Daniel Royer was having a superb season before hurting his knee in early August. Marsch said Royer, the sort of unheralded foreigner who probably would’ve been passed over by former regimes, may see action Wednesday. Both coaches also continued to maximize their opportunities by taking the Open Cup seriously. They fielded mostly first-choice lineups in the fourth round (when MLS enters the tournament) and said Monday that the competition carries significant weight when they plan or assess a season. In other words, winning creates a winning culture. “This tournament is very special, and I think it takes a very well-coached and determined team to get to this point,” Vermes said. “It’s not easy juggling both league play and this competition, but the teams that have players that are serious about it and are ambitious, they’re able to navigate both. Sporting has won and lost big games under Vermes. But the consistent application of his values (and the club’s) keeps them in the hunt even as players come and go (only four of the 13 men who played in MLS Cup 2013 remain). See Graham Zusi’s successful transition to right back as a prime example. Establish a culture and compete in enough important matches and eventually you’ll break through. That’s what Marsch is hoping to accomplish with New York. It's been nine years since the Red Bulls reached a final, and they've never won one. He can’t erase Metro Playoff Failure, and he won’t wake up in the morning with the budget of New York City FC or Toronto FC. So both men rely on system and leadership, and they tinker with tactics and lineups until the game breaks their way. It has been at Sporting. Now Vermes is trying to sustain it. It hasn’t been at Red Bull Arena, at least when the games matter most. Marsch is trying to establish it. One will take a massive, historic step forward Wednesday night. The Open Cup is a trophy. But it’s also a title, as well as a potential piece of validation for two teams following a unique and challenging path.